Languedoc-Roussillon is a vast area of southern France, covering the region between the Rhone in the north, and the Pyrenees Mountains in the south. Throughout its long and varied history, the area has changed hands many times, and the Catalonian influences are strong. In fact, it was not until the 16th century that the French finally gained possession of this much prized region. Even the name, Languedoc, stems from the language once spoken here. In such a large area, you can expect all manner of stunning Languedoc properties, from rustic farmhouses overlooking fields of sunflowers, to studio apartments in medieval towns to typical Mediterranean villas with swimming pools. The climate is typical for the South of France, with long, hot summers and pleasant, sunny winters. Inland, under the imposing shelter of the mountains, the seasonal variations are more pronounced; but the sandy, Mediterranean beaches that border the region to the east are worth a visit in any season. Imagine relaxing beside a pool, soaking up the sun and looking out across the countryside from your own terrace. As would be expected, food and wine production is abundant in Languedoc. The hills and mountains are dotted with sheep and goats, which produce the speciality cheeses of the area. The valleys are filled with fields of olives, fruit and lavender. Wine has been produced in the region for over 2,000 years, and the whole region abounds with vineyards. All along the coast, fresh fish and shellfish are caught daily, allowing a wealth of gastronomic delights. The diversity of Languedoc is almost unparalleled. As well as drawing visitors who come solely to partake in the exquisite food and wines, there is something to suit all tastes. The beaches, washed by the crystal clear Mediterranean Sea, are both a haven of relaxation and an opportunity to try water sports of every description. Inland, the mountains provide inspiration for painters and hikers alike, both enjoying the breathtaking scenery in their own way. In the towns, there are cookery courses, unrivalled for their fresh and tasty ingredients, museums, art galleries, and sites of historical interest. Most of the towns and villages in the Languedoc region hold numerous fetes and festivals during the year. These are as varied as Languedoc itself, and include outdoor theatre shows, food and wine festivals and authentic medieval fairs, to name but a few. With the Spanish influence strong in the region, traditional bullfights are common. Of particular note are the 'Course Camarguaise', which retains tradition while ensuring no harm comes to the bull, and the ‘fete votive’, where bulls are allowed to run the village streets. These are held in numerous villages around the region throughout the year. Most towns hold regular markets, still held in the historic market squares. The local food produce on sale is varied, but renowned for its freshness. Other markets are held for non-food items, such as the antique fairs offering many bargains. Properties in the Languedoc region can be found for as little as 50,000 euros or less, or at the other extreme, exceeding 20 million euros. The sports facilities offered by Languedoc are too varied to list, having everything from paragliding to scuba diving, and everything in between. Languedoc-Roussillon is comprised of five departments; north to south these are: Lozere, Gard, Herault, Aude, and the Pyrenees Orientales. 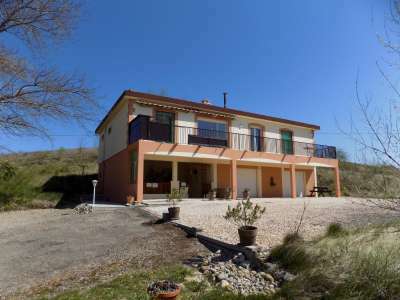 All but Lozere, with its breathtaking scenery from the mountains, border the sea. The Gard is named after the river which runs through the department, inciting the Romans to settle and make Nimes the ‘Rome of France’. The Rhone delta is also situated in this department, where pink flamingos have been known to search for food along the marshy banks. Gard has numerous sporting opportunities, including canoeing in the Gorges du Gardon, horse riding in the oak forests or mountain biking following the route of the Roman aqueduct. Herault, the most prolific wine-producing area in France, has a wealth of beautiful scenery. From scrubland to forests, to long, sandy beaches, Herault has it all. The 'Bassin de Thau', a spectacularly huge lagoon in the south of the region draws visitors and shellfish hunters alike. The department of Aude is known for both its wine and its historic castles and abbeys. As well as miles of unspoilt sandy beaches, Aude’s famous Canal du Midi runs through the department, offering the opportunity for barge holidays. The Pyrenees-Orientales has a distinctly Catalan feel, having been, until fairly recently, a part of Spain. Its landscape is diverse, with beaches, mountains, vineyards, valleys that climb to the Pyrenees, and flat inland plains. Leisure possibilities including skiing on the high plateau of the Cerdagne. The scenery here is fabulous with pine forests and glacial lakes adding a magical dimension. The Lozere department covers the southern part of the Massif Central, including the mountainous regions of Aubrac, La Margeride, Le Gevaudan, and the Cevennes. Lozere has an identity all of its own, with many traditional local customs, and many speciality dishes unique to the area. The capital of the Lozere department is Mende, a tranquil town on the river Lot. The narrow medieval streets, in places lined with grand Renaissance houses, seem to always lead to the Cathedral Notre Dame - a spectacular 14th century building with beautiful stained glass windows. The town is a good base for exploring the countryside with boating, canoeing, walking, cycling and riding facilities all nearby. The largest, and perhaps the most rewarding, city in Gard is Nimes. Founded by the Emperor Augustus, it flourished at once due to the 'Pont du Gard' which brought water to the city from the natural springs in Ales. Much of the Roman architecture remains remarkably well preserved. 'Les Arenes', a replica of the Colosseum in Rome, still hosts many traditional French and Spanish pastimes. In addition to the historic sites and many museums, Nimes is a beautiful city, with many parks and gardens. This area includes many beautiful Languedoc properties including chateaux, townhouses, villas and farmhouses, and also apartments of every size. To the northeast of Nimes lies the beautiful old town of Uzes. Perched on the hillside, it has breathtaking views and the Renaissance architecture of the buildings themselves has been lovingly restored, making Uzes a truly beautiful town with much to offer those buying Languedoc property. Aigues-Mortes, located towards the sea is a charming example of a walled town. Like Uzes, it too has spectacular views, but this time to the Petite Camargue. Nearby Ales nestles alongside the Gard river, offering many opportunities for water-based activities. The town was once an important centre for coal mining, started, almost improbably, by the monks that once lived here. Now the coal industry has left, leaving behind a town whose industry now thrives on the natural beauty nearby. The 'Parc National des Cevennes' is a haven for wildlife and offers many opportunities for hiking, ornithology, caving, etc. With such a wealth of natural splendour on offer, Languedoc property is an ideal way to enjoy and live life the French way.